It's time to give your medicine cabinet a check up. When was the last time you checked your medicine cabinet? - Discard outdated medications and supplies, including sunscreens. Another important thing to consider is the location of your medicine cabinet, as many of us think that it should be placed in the bathroom. Contrary to common practice, medications should not be placed in showers or baths as these create heat and humidity which can cause deterioration to some drugs. Although other items like gauze, tweezers, cotton balls and bandages can be kept in the bathroom as these will not be affected by the elements, it is wiser to organize all first aid items together as it will be easier to find and retrieve when you need it. It is also important to keep all original containers and labels in order to assure that no one in the family ingests medicines by mistake. For homes with children, it is important to stock up on age-appropriate medicines (and keep the dropper or cup it comes with). One must be aware of each child’s age and weight in order to ensure that the proper dosage is administered. 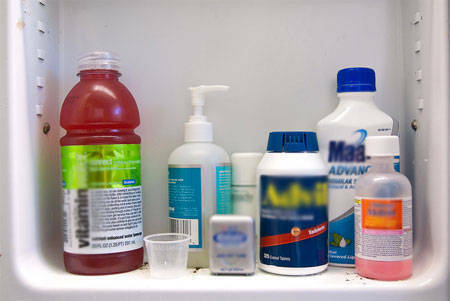 Also, make sure that all medications are closed tightly and are kept in a place where a younger child has no access to. - Remove and destroy any and all identifying personal information on medicine bottles and containers. - Do not flush medicine into sinks and drains; rather, they must be poured into sealable plastic bags. - If medication is solid, like pills and tablets, these must be crushed and diluted with water. After pouring and diluting medications in the plastic bags, an additional step would be to pour kitty litter, saw dust, coffee grounds or any material that will mix with the substance you are disposing of. These precautions ensure that children or pets will not mistake these for candy or treats. Finally, make sure that all these are disposed of properly into your household trash bins. Is Sperm-killing Ultrasound the New Male Contraceptive?